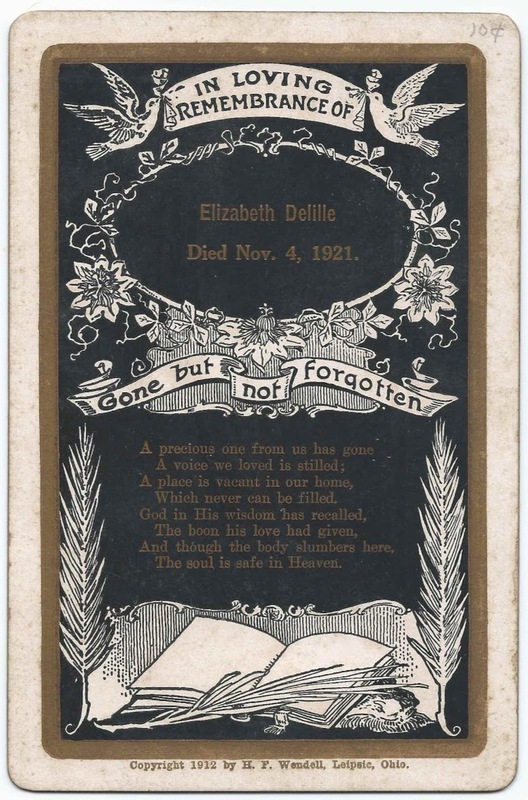 Memorial card of Elizabeth Delille, who died on November 4, 1921. The card was produced by the studio of H. F. Wendell of Leipsic, Ohio. Searching online, I found a death record for a Lizzie Delille who died on November 4, 1921, in Gallia County, Ohio. She was possibly the daughter, born about 1858 in Ohio, of Joseph and Isabella (Martin) Delille of Springfield, Ohio. If you can corroborate the the above identity of Elizabeth, or offer an alternative identity, please leave a comment or contact me directly. Thanks!